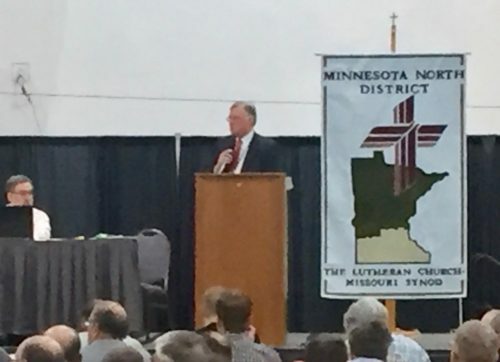 Minnesota North Convention and Project 24 – part 2 | "Northern Crossings"
I have not had the chance to live stream the Minnesota North Convention but I have it on good authority that Rev. Don Fondow has been reelected and congratulations are in order. I have said that I am not always sure that congratulations are in order when someone is elected to be a DP but service in the church is a vocation special gifts are needed and Rev. Fondow has them all. He is extremely well organized, and prepared. He is pastoral and concerned for the welfare of all God’s people. He is mission oriented and a churchman. I traveled with him in Kenya as he was checking out the Project 24 work before the Minnesota District decided to partner with the North Dakota District in that work and I can attest that one of his other talents is the ability to find the comfy car when undertaking a hot and difficult journey over horrible roads. Congratulations and God’s blessing President Fondow. What Does a Wind That Blows Half Way Around the World Have to do with the Gospel?